What is protein and what are the benefits of getting the correct protein-to-energy ratio? Protein is an essential nutrient for horses and is vital for growth, repair, muscle formation, tissue growth and for enzymatic and endocrine function. In fact, after water, protein is the most vital nutrient the body needs. Protein is made up of amino acids which are commonly referred to as the building blocks of the body. There are 21 amino acids with 10 classified as being essential. These must be supplied within the diet as they cannot be synthesised by the horse. The main essential amino acid is lysine which is vital for growth and nitrogen balance and is often the most deficient within a forage-based diet. There is a lot of research published online as various researchers have studied the requirement for lysine in growing horses. Their research has shown that horses, on a diet which is deficient in lysine, will grow more slowly than horses on a diet high in lysine in spite of crude protein percentages, in both diets, being identical. But, many horse owners have queried whether or not protein content in some horse feeds has caused health and behavioural problems in their horses. Different research studies published online, however, has shown that this essential nutrient has more benefits than originally thought. Higher proteins are often associated with higher starch levels. However, research shows that it is an increase in starch levels which can result in issues such as colic, laminitis and excitability. So what are good protein sources for your horse? In terms of the amino acids, we have mentioned above, when you are tailoring a balanced diet for your horse it is vital that sufficient quantities of these amino acids are included. Things like soyabean meal, for example, is widely used because of its desirable amino acid profile and is also the highest source of crude protein with levels at 48 per cent. Another legume source is alfalfa. Alfalfa has the ability to 'fix' nitrogen from the atmosphere - in fact alfalfa fixes more nitrogen than any legume crop. Alfalfa is now being used more commonly as a protein in horses' diets. What is the best protein-to-energy ratio for horses? There's no doubt about it, you must consider both protein and energy together when tailoring a diet specifically for growing horses. A deficiency in the ratio can result in a decrease in the growth rate which can contribute to further bone development issues. An excess in protein, along with inadequate energy, requires protein oxidase to produce more energy which is consequently an expensive source of energy for the horse. Amino acids aid growth and repair, however, without the energy, the protein can't be synthesised correctly. Why should you avoid excessive amounts of protein in your horse's diet? Urea levels within the blood increases which can result in an increase in urea excretion into the gut which increases the risk of gastrointestinal disturbances. Protein digestion generates more internal heat compared to the breakdown of other nutrients for energy. This excessive heat is not desirable in performance horses. An increase in ammonia in the stabled environment which has been shown to causes detrimental effects to the respiratory tract. What happens if your horse is deficient in protein? What are the protein requirements for performance horses? 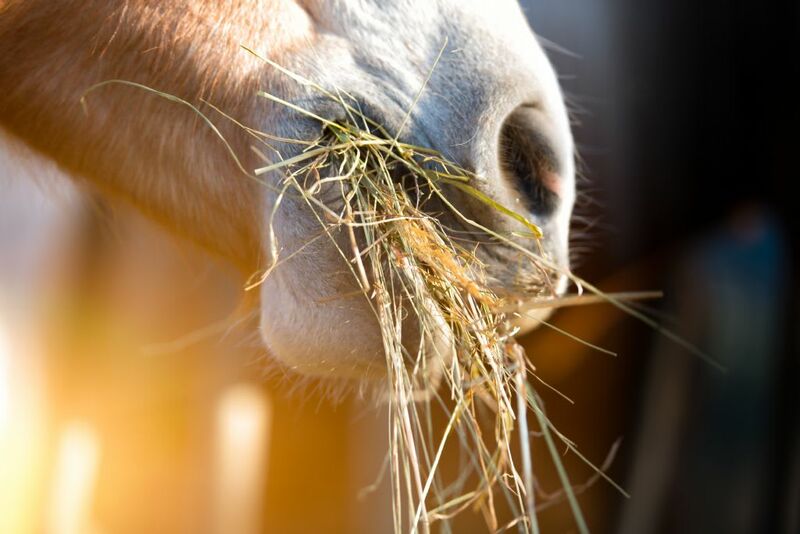 Kathleen Crandell, PhD, and equine nutritionist with Kentucky Equine Research, (KER) said: "Forages, cereal grains and seed meals all contribute to the basic protein requirements of performance horses. Forages are excellent sources of protein and amino acids, though the type of forage will determine protein quantity." Protein is important for muscle health and repair as well as being vital for other body processes but it should not be considered a primary energy substrate for performance horses. Energy requirements for performance horses should come from a mixture of energy sources. Some performance horses are sensitive to starch so must rely on fat and fermentable fibre. Performance and racing horse feeds often contain 14 per cent protein. This usually compensates a decrease in forage intake. It's also beneficial for young horses in training.